Do you struggle with the deep pain of a broken relationship with a parent? What does the Bible say about forgiveness? Why must we forgive at all? How do we honor those who act dishonorably toward us, especially when those people are as influential as our parents? * Can we ever break free from the “sins of our fathers”? What does forgiveness look like in the lives of real parents and children? Does forgiveness mean I have to let an estranged parent back into my life? Is it possible to forgive a parent who has passed away? Through the authors’ own compelling personal stories combined with a fresh look at the Scriptures,Forgiving Our Fathers and Mothers illustrates and instructs in the practice of authentic forgiveness, leading you away from hate and hurt toward healing, hope, and freedom. Want to know what I'm an expert at? Holding at grudge. Yep, it's true. It's not something I'm proud of. Forgiveness is something we all struggle with. This book takes you on a journey of forgiveness. It does an excellent job of connecting with someone whose parents have blown it. And let's face it, we've all blown it at one point or another as parents. This book shows readers how to process the pain through a scriptural filter and releases them into the freedom of their future made possible by God’s grace in Christ. There are children that went through terrible horrors at the hands of their parents. I've always wondered how the commandment “Honor Thy Mother and Father” fit into the lives of such children. How could they honor people that did not honor them? The author uses biblical characters to help explain the process of forgiving. The author draws you into each chapter with reflective questions at the end. I can easily see this book for those who have a difficult time forgiving Aunts, friends, Uncles, Brother and Sisters. I could see this book being used in a healing ministry discussion group. 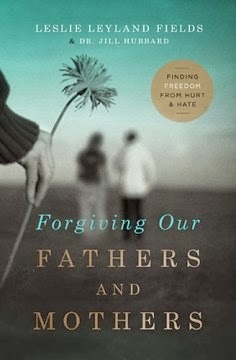 Overall, this book was very good at teaching how to forgive and I recommend anyone who has experienced hurt to read it.